Print media guides? Who will need stinkin' print media guides now that the much balleyhooed and hyped iPad is arriving in stores? The answer is no one will if, and only if, two things happen. The first is that teams at all levels will need to get all of their historic and current information into digital form. The second is that collegiate and professional teams/leagues would need to come together and agree on a presentation standard across all leagues and teams. While these are big "IF", the results could be a transformation for the sports broadcast booth (and production trucks), as well as print media, that is unlike any other. This is not hype, this is truth, and here is why. Getting ready for a live game production is a paper intensive event. Producers, associate producers, production assistants (broadcast associates in the parlance of CBS Sports and FOX Sports), and on-air game talent spend countless hours going through media guides, online sites, and historical information to prepare for a game. When they arrive at a game site, they are laden with the heavy and mostly useless print media guides that contain SOME information they may need during a broadcast. When they leave, they more often than not toss them in the trash to lighten their load. In fact, the recent drive by the NCAA to eliminate print media guides has many that work in the sports broadcast industry cringing. On-air talent (and their statisticians) need a reference they can quickly open to get the information they need. The current idea being pushed by the NCAA and some conferences is to put the information on-line. In the parlance of Twitter and other social media, this is a big #FAIL for a number of reasons. One is the configuration of the broadcast booths. Not all booths are equal. Take a tour of the press boxes of stadia and arenas. You will be amazed how different they can be in size and shape. In many of them, there is no place to put a laptop to access information. Don't believe me? Take a visit to Death Valley in Clemson, the old TV booth at RFK Stadium in Washington, D.C., or even the auxiliary television booths at Sanford Stadium at the University of Georgia. Try to find space in the TV booth at the Honda Center in Anaheim, California. Heck, even the camera can fit in there. A print media guide you can grab off the floor, get what you need, and toss it back on the floor. Try that with a laptop or netbook. Another practical reason is that wireless access in a TV booth is spotty, if available at all. If information is only available online, it becomes inaccessible. PDF files are whole other nightmare because they are not easily accessible, even if stored locally. And then you have to guess where the information is stored in the document. The iPad changes all of that. That is, it can change all of that if designed intelligently from a user's perspective. 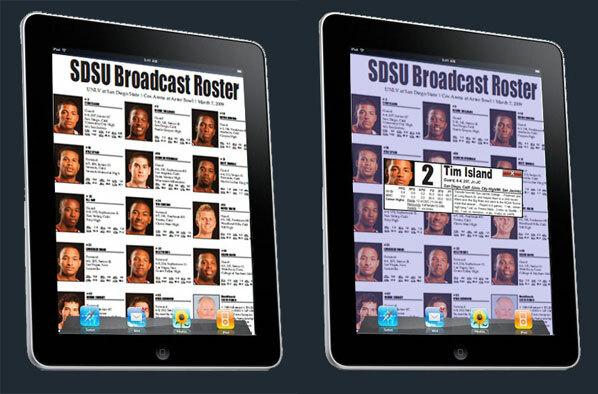 In the image above you see a simulated iPad interface with a broadcast flip card from San Diego State University. All a commentator or statistician would have to do is tap the players picture and a biographical/stats summary could come up, or all of their historic and current stats could display. Even though many of the announcers I have worked with say they are technophobes, they still use Blackberries and iPhones during a game to read their email or get scores from other games. So the iPad can keep them in their comfort zone. Add to this the small physical footprint of the iPad. It is compact and lightweight. It will fit easily into their satchels. Production and talent can pull it out on an airplane and do their work (assuming off-line content availability in the "app." On-air talent can have it sitting next to their monitors during a broadcast and easily get the information they need. No longer would they have to put their own notes next to players names on their spotting charts or basketball rosters. It would be just a quick touch away. Of course, they may still want to do that as a safety net, but they would not have to. These thoughts are not new to me this week. When the iPad was first announced, people asked what good it would be in a practical work environment. This was my immediate thought. Now that Apple is delivering the product, hopefully someone will make it a reality. Oh wait, there is already one collegiate conference that had their iPad application ready to roll out a few months ago. That conference will not have to wait. So for all of the leaders and thinkers out in the sports information world: the iPad is ready to transform the way information is distributed and consumed. Are you ready get together and come up with some standards? Are you ready to join in the revolution? Interesting thoughts, but I worked with a few television crews this basketball season that don't like that media guides are going digital. They need to have several pages in front of them at one time and don't like clicking from one page to the next. Did anyone contact the people that use these tools before going digital? One massive problem, which has been whined about ad nauseum by iPad haters but is really relevant to college athletics - the lack of Flash support. The vast majority of live stats run by colleges are Flash based. The main providers (CBS College Sports, JumpTV, ICS, and Presto) have been working on non-flash alternatives, but I haven't seen them at all for basketball or football yet.